We purchased our property on Sleepy Hollow Lake in 1973, because we wanted to live in a protected (deed restricted) country setting that was free of hunting, and where we could enjoy the natural environment just outside our door. This photo journal is dedicated to the preservation of this natural beauty for all future generations. It is also presented as an encouragement to others that people can have both modern conveniences (paved roads, water, sewer, electricity, telephones, and cable TV) without destroying the environment. We can live in harmony with nature. (Sleepy Hollow Lake - Deer Crossing Sign) When we first went to Sleepy Hollow Lake to look at the property they had for sale, we saw this sign north of the entrance and between the two Tommy Trail Crossings. It was part of our assurance that Sleepy Hollow Lake was a no hunting community where the deer and other animals would be our neighbors. See our White-Tailed Deer photos. This sign remained in place until it was removed to repair a drainage ditch around the year 2010; the sign was not replaced. Some people want to scapegoat deer as an excuse to kill them, but there are compassionate ways of controlling over-population, if it becomes a problem. 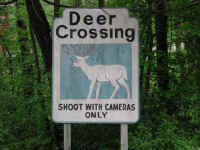 See: Deer Population Control (Non-Lethal). (Sleepy Hollow Lake - 01) This photo was taken in early April, 2001 before the ice melted on Sleepy Hollow Lake. We are looking east-southeastward from our home. (Sleepy Hollow Lake - 02)This photo was taken at the same time we took the previous photo. 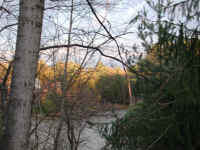 In this one we are looking eastward across the lake from our home. 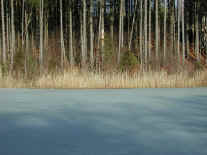 The long afternoon shadows of the trees on the hill behind us are stretching almost completely across the frozen lake surface. (Sleepy Hollow Lake - 03) In this photo, we are looking southeastward into the cove across the lake from our home. 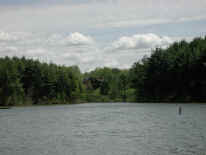 The buoy (on right) is a warning notice to boaters that they are entering a "no wake zone" on the lake. 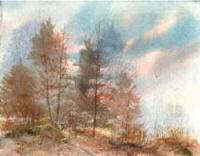 The home at the end of the cove almost disappears into the surrounding woods, preserving the natural beauty. (Sleepy Hollow Lake - 04) We took this photo from our canoe while looking at the headwaters at the northeastern end of Sleepy Hollow Lake, where the tree branches almost completely cover the lake leaving it in near total shadow. The small ripples on the surface of the water give an interesting character to the tree reflections. (Sleepy Hollow Lake - 05) We thought this was an interesting outcropping of rocks, plants, and even dead wood at the northeastern end of Sleepy Hollow Lake, which added to the natural character of the surroundings. 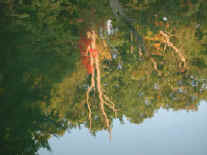 (Sleepy Hollow Lake - 06) No, there's nothing wrong with your eyes; and yes, you are seeing right-side-up and up-side-down at the same time. In the foreground we are looking at the tops of sumac in their fall color, and the trees in the background are being reflected in the smooth surface of Sleepy Hollow Lake, just north of the Murdererskill Road bridge. (Sleepy Hollow Lake - 07) It was shortly before sunset. The shadow line was creeping up the trees when we took this photo of a tranquil section of the northwestern portion of Sleepy Hollow Lake, where it begins to narrow to the width of a stream. (Sleepy Hollow Lake - 07A) This is a picture of dual reflections: the reflection of trees, rocks, colors, light and shadow upon the quiet surface of Sleepy Hollow Lake, and the time to reflect upon the beauty of God's creation and our responsibility to preserve and protect it. 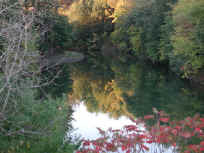 (Sleepy Hollow Lake - 08) This late afternoon photo captured the beginning of the autumn color change on a bank of Sleepy Hollow Lake, south of the Murdererskill Road bridge. (Sleepy Hollow Lake - 09) This is a close up view of the reflective surface of Sleepy Hollow Lake, with trees and sky suspended up-side-down. (Sleepy Hollow Lake - 10) The light rippling on the surface of Sleepy Hollow Lake imparts a "Monet painting" (impressionist) quality to the reflection. 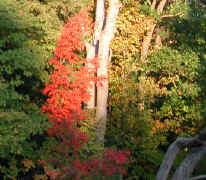 (Sleepy Hollow Lake - 11) We took this photo in the late afternoon on 20 November 2003 as we were looking southeastward through the trees at the last of the setting sun highlighting the tops of the trees across the lake with a golden glow. (Sleepy Hollow Lake - 12) We took this photo on 15 December 2004 as we were looking southwestward across the lake from Tammy Trail Park. 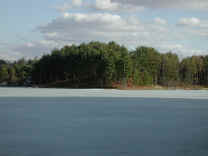 A few patches of unmelted snow can be seen in the woods across the lake. 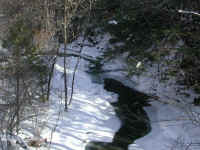 (Sleepy Hollow Lake - Murdererskill Ravine - 01) We took this picture from the Sleepy Hollow Road bridge. 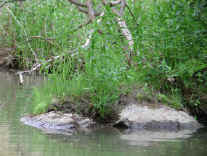 The Murdererskill is the major creek feeding Sleepy Hollow Lake. 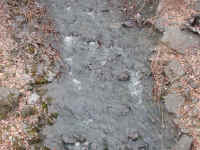 The ice had covered most of the stream preventing the snow from melting. The areas of open water add an interesting contrast. (Sleepy Hollow Lake - Murdererskill Ravine - 03) This is another view from the Sleepy Hollow Road Bridge, looking eastward. 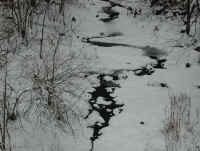 The ice and snow cover had been melting, leaving only white borders along the Murdererskill. 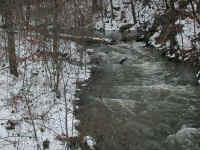 (Sleepy Hollow Lake - Murdererskill Ravine - 03a) The remnant of the Murdererskill's ice overhangs the flowing water. 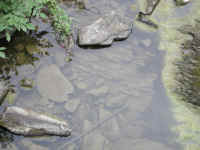 (Sleepy Hollow Lake - Murdererskill Ravine - 04) The waters of the Murdererskill flowing under the Sleepy Hollow Road bridge. (Sleepy Hollow Lake - Murdererskill Ravine - 05) The Murdererskill bringing the waters of the spring thaw into Sleepy Hollow Lake. In this photo we're looking westward from the Sleepy Hollow Road bridge. (Sleepy Hollow Lake - Murdererskill Ravine - 06) We're looking eastward at the waters of the Murdererskill flowing toward Sleepy Hollow Lake. (Sleepy Hollow Lake - Murdererskill Ravine - 07) One of the highlights of our walks around the northern loop of Sleepy Hollow Road is looking off the bridge into the Murdererskill ravine. 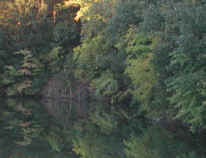 This photo of a placid pool was taken on the east side of the bridge. 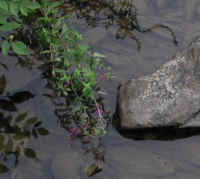 (Sleepy Hollow Lake - Murdererskill Ravine - 08) It's also enjoyable to take a closer look at the "simple" beauty of God's creation: the rocks, the water, and the overhanging plants with their watery reflections. 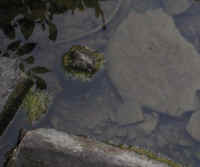 (Sleepy Hollow Lake - Murdererskill Ravine - 08a) This is a picture of the water, rocks, algae growing on the rocks, and the reflections of overhanging tree branches. 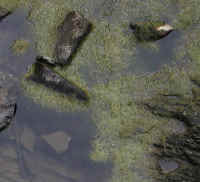 (Sleepy Hollow Lake - Murdererskill Ravine - 08b) Almost every place we look, there is another point of interest: the little rock islands, the algae "sea" that surrounds them, and the rocks that lie beneath the water. The more we become aware of the little segments of creation, the closer we come to respecting and wanting to preserve the whole of creation, and realizing that we don't have to "improve" it. 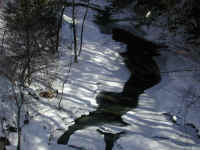 (Sleepy Hollow Lake - Murdererskill Ravine - 09) In December of 2002, we had several inches of snow followed by a whole day of rain. 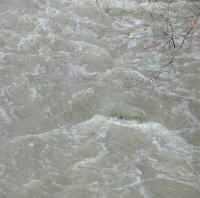 The next day, we took a photo of the surging waters of the Murdererskill. This view is from the west side of the bridge. 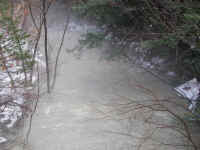 (Sleepy Hollow Lake - Murdererskill Ravine - 09a) There is something fascinating about listening to the roar of the surging Murdererskill and watching the waters boil over the rocks of the creek bed. (Sleepy Hollow Lake - Murdererskill Ravine - 09b) This is another view of the waters of the Murdererskill as they surge around and over a rock. (Sleepy Hollow Lake - Murdererskill Ravine - 10) This is another view of the Murdererskill from the west side of the bridge, looking farther to the west. (Sleepy Hollow Lake - Murdererskill Ravine - 10a) This is a closer view of the Murdererskill where the waters begin to flow over the rocky bottom to the west of the bridge. 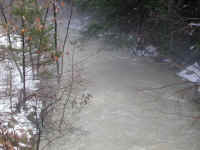 (Sleepy Hollow Lake - Murdererskill Ravine - 11) The waters of a swollen small drainage stream churn and foam as they meet the waters of the Murdererskill. 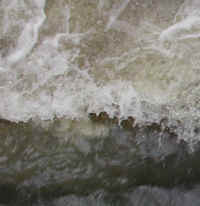 (Sleepy Hollow Lake - Murdererskill Ravine - 12) This is a closer look at the surging waters of the Murdererskill just before they pass under the bridge. 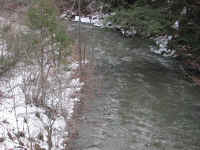 (Sleepy Hollow Lake - Murdererskill Ravine - 13) This is a view, from the bridge, of the surging Murdererskill flowing eastward. (Sleepy Hollow Lake - Murdererskill Ravine - 14) In this photo, we are looking downward from the east side of the bridge at turbulent waters of the Murdererskill. 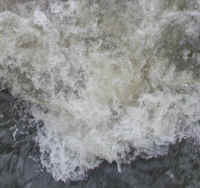 (Sleepy Hollow Lake - Murdererskill Ravine - 14a) This is a closer look at the turbulent splashing water and foam. (Sleepy Hollow Lake - Murdererskill Ravine - 14b) This is another look at the turbulent splashing waters of the Murdererskill. 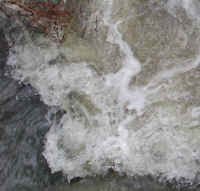 (Sleepy Hollow Lake - Murdererskill Ravine - 15) The swirling waters create a seemingly never-ending series of patterns in the Murdererskill. (Sleepy Hollow Lake - Murdererskill Ravine - 15a) This is a closer look at the churning waters that produce the foam patterns. (Sleepy Hollow Lake - Murdererskill Ravine - 15b) This is our final look of the day at the splashing waters of the Murdererskill before we continued on our walk. 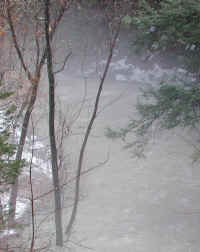 (Sleepy Hollow Lake - Murdererskill Ravine - 16) We took this and the following photos looking eastward from the bridge over the Murdererskill on Sleepy Hollow Road in February 2005. 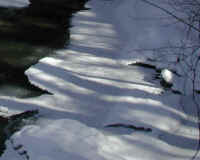 (Sleepy Hollow Lake - Murdererskill Ravine - 16a) This is a closer look at the light and shadow on the ice and snow along the side of the creek that attracted us to take these photos. 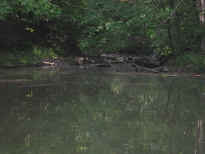 (Sleepy Hollow Lake - Murdererskill Ravine - 17) This is another view of the Murdererskill as it flows eastward away from us. (Sleepy Hollow Lake - Murdererskill Ravine - 18) In this photo, we are looking straight down from the bridge. 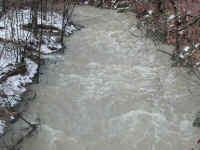 (Sleepy Hollow Lake - Murdererskill Ravine - 19) We took this and the following photos of the swollen Murdererskill on 18 Feb 2008. We are looking eastward from the bridge. We had rain over night and by late morning the sun was shining and the temperature had risen into the mid 50s causing rapid snow melt and runoff. 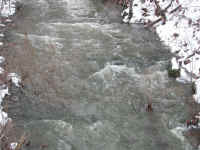 (Sleepy Hollow Lake - Murdererskill Ravine - 20) This is another photo of the eastward flowing Murdererskill as it flows eastward. We particularly like the way the misty fog site in the valley. (Sleepy Hollow Lake - Murdererskill Ravine - 20a) This is a closer look at the misty fog covered Murdererskill ravine. 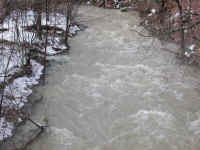 (Sleepy Hollow Lake - Murdererskill Ravine - 21) In this photo we are looking westward from the bridge as the turbulent waters of the Murdererskill as they flow towards us. 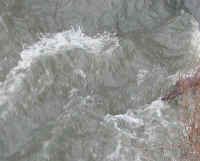 (Sleepy Hollow Lake - Murdererskill Ravine - 21a) This is a closer look at the turbulent Murdererskill. 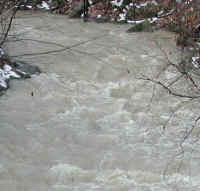 (Sleepy Hollow Lake - Murdererskill Ravine - 22) This is another look at the Murdererskill flowing towards us. (Sleepy Hollow Lake - Murdererskill Ravine - 22a) This is the last bend in the Murdererskill as it heads toward the bridge. 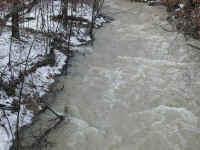 (Sleepy Hollow Lake - Murdererskill Ravine - 23) This is another view of the Murdererskill flowing towards us. (Sleepy Hollow Lake - Flood - 01) This and the following photos were take on 18 September 2004 of our waterfront on the 323 acres of Sleepy Hollow Lake surface area. Following a tropical depression that had moved through our area in Upstate New York with heavy rains, the lake level raised about three feet. Between the tree and the sloping grass area is a walkway along the lake, which is under the flood water. (Sleepy Hollow Lake - Flood - 02) At normal water levels, this bush and the iris plants are growing on dry land between the lake and our pathway. (Sleepy Hollow Lake - Flood - 03) In this photo we are looking southeastward along the lake. The rose bush and the evergreens are growing above the pathway, which is now underwater. In the upper right our floating dock and canoe can be seen rising out of the flood waters. (Sleepy Hollow Lake - Flood - 04) The shrubs growing out of the water are normally growing on dry land that is more than a foot above the lake. (Sleepy Hollow Lake - Flood - 05) These chairs should be resting on a grassy plot above the walkway, and the walkway to the dock is level with the walkway, but it is now under water. From the debris line on the chair legs, we can see that the lake has already receded several inches. (Sleepy Hollow Lake - Flood - 06) Without the rains continuing to fall, and the massive amount of water flowing over the spillway at the southern end of the lake, the flood waters continue to recede. This is another interesting aspect that living beside the lake provides. (Sleepy Hollow Lake - Flood - 07) If it wasn't for our canoe and dock floating above the flooded lake waters, it would be hard to tell that anything disturbed any of the beautiful aspects of the lake. (Sleepy Hollow Lake - Flood - 08) Even with the lake waters continuing to recede, we would still get our feet wet if we sat in our chairs. (Sleepy Hollow Lake - Flood - 09) The lake level continues to recede, but it is still about our lakeside walkway. (Sleepy Hollow Lake - Flood - 10) This is another look at our shore line as the waters continue to recede. The water level is still about 2-1/2 feet above normal. (Sleepy Hollow Lake - Flood - 11) This is a closer look at the base of our rosa regosa rose bushes and two of our junipers that normally grow above the pathway along the shore line.